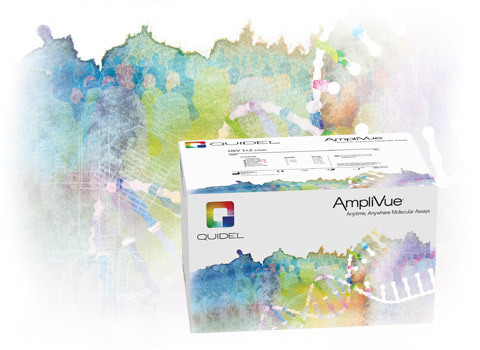 The AmpliVue HSV 1+2 Assay is an in vitro diagnostic test for the qualitative detection and differentiation of Herpes simplex virus type 1 (HSV-1) and Herpes simplex virus type 2 (HSV-2) nucleic acids isolated from cutaneous and mucocutaneous lesions of symptomatic patients. The assay consists of three major steps: (1) specimen preparation (one-step dilution), (2) isothermal Helicase-Dependent Amplification (HDA) of target amplicons specific to HSV-1 and HSV-2, and (3) detection of the amplified DNA by target-specific hybridization probes via a colorimetric reaction on a lateral-flow strip which is embedded in a self-contained disposable cassette to prevent amplicon contamination. Specimen preparation involves a simple one step dilution in which specimens in viral transport medium are added to a dilution tube. The diluted sample is transferred into Reaction Tube containing lyophilized mix of HDA reagents including primers specific for the amplification of HSV-1 and HSV-2. Competitive amplification of the process control DNA takes place unless amplification inhibitory substances are present or the sample processing fails. After completion of the HDA reaction, the Reaction Tube is transferred to a Cassette for rapid detection with the test result displayed as test and/or control lines in the window of the Cassette. The dual-labeled probe-amplicon hybrid is then detected by the lateral flow strip within the Cassette. The HSV-1 amplicon is captured at the T1-Line and HSV-2 amplicon is captured at the T2-Line, while the process control amplicon is captured at the C-Line. The Biotin in the amplicon-probe complexes captures the streptavidin-conjugated color particles for visualization and the molecular test result is shown as colored lines that are visually read. Easy-to-use format, just rehydrate with diluted sample. Eliminates need for dedicated molecular space and costly capital equipment. Allows for testing in smaller labs. No freezer needed. 2°C to 8°C storage.